The return of the book reviews after a lengthy hiatus will be short and sweet. That’s mostly because the book I’m reviewing is short and sweet. And fun. Walking through the library last week, I saw a book on the new non-fiction release shelf. It immediately intrigued me. 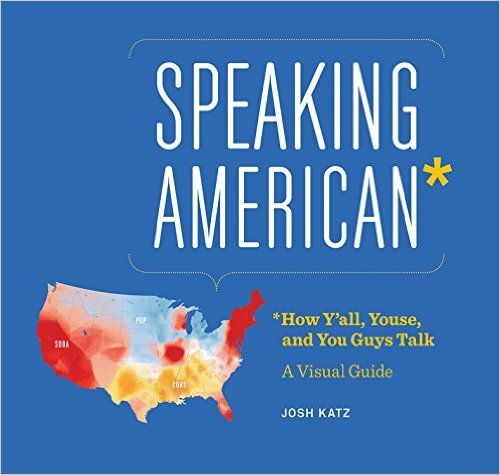 Speaking American by Josh Katz jumped out at me with its bright cover and its subject matter. As a college student I was very interested in linguistics. Linguistics is the study of language and its history and structure. I took Latin in high school, and there first found my love for language. The way we speak evolves over time. Not only do people from the United States, England, and Australia speak English, they speak very different dialects. Anyone traveling across the US will be able to tell you that there are countless dialects of English just within our own borders. The amazing thing is how different our American English is from region to region. Josh Katz explores the different ways we say things from place to place. Is it a “firefly” or is it a “lightning bug?” Is it a “garage sale” or a “yard sale?” These questions are asked and answered, complete with maps showing where each term is more prevalent. There are even short write ups on terms that are unique to specific areas, such as “thruway” in Buffalo, and “yins” in Pittsburgh. This book was a lot of fun to read. Katz began his project with a dialect quiz in the New York Times, but it soon grew into this spectacular book. It is really the maps that make this book so much fun. It helps us to see where our home region relates to the rest of the country with the vernacular. If you’re looking for a book that will help you deliver the big win in the neighborhood Trivial Pursuit tournament, then this is the book for you. It will not take you a ton of time to read. I read through the whole thing in just over an hour. I spent a lot of time just looking at the maps. This book is a great way to learn something new without realizing that you’re actually learning something. Craig Bacon really loves reading. In this house, we call them books. Others in the country may call them e-books. People born after 1990 are more likely to call them e-books.